I am participating in Picture Books 14:14, a challenge created by Christie of Write Wild that encourages bloggers to review 14 picture books in 14 days, starting on Feb. 14th. I am also including this post for Poetry Friday, which this week is being hosted by Linda at Teacher Dance. I was so happy to see yesterday the "rule change" allowing us to share one somewhat older picture book, as I had had my heart set on sharing this one for rhyme. 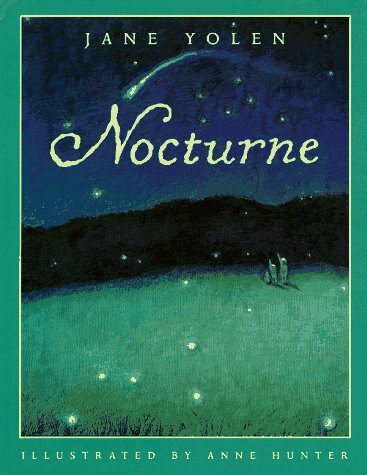 Nocturne is a simply magical book and one destined to stay a classic. I am generally not a fan of rhyming picture books. There are so many out there that are sing-songly, annoying, and have to really ram words together in odd ways to make an attempt at getting the meaning across. Nocturne is not that book. Isn't that gorgeous? This opening format begins each of the four sentences that comprise the entire story. For the second one, the third line becomes "in the quiltdown quietdown velvet night" followed by "moths flutter up, flutter down / like wind-up toys, without the noise." Read it out loud to yourself. Feel the way your mouth and lips move and how that motion repeats due to the repetition (flutter up, flutter down) and internal rhyme (toys/noise). Every time I read this book aloud to children, it is amazing how fast everyone becomes quiet. No matter the external situations, this is a book that inspires wonder for the power of its words and rhyme. The last stanza in the book is by far my favorite, but I won't ruin it here. Read it for yourself (preferably out loud). You won't be disappointed. Jane Yolen is a master of language. She's an amazing writer and person. Thanks for sharing Nocturne! Thanks, Manju. This one is a treasure. I love a good rule breaker... It's great to study new books, but you just can't argue with a classic! Absolutely! Classics are classics for a reason. This really does sound like a wonderful picture book lullaby. Thanks for sharing it today. I know and have several of Jane Yolen's books, Katie, but have not heard of this one. It 'sounds' great. Thanks! This is definitely in my Top 5 of her books. You should check it out! How beautiful. Rhyme can leap and laugh or rhyme can still the soul. This lovely verse from a richly talented author quietens the heart. Perfect example, Katie. Thanks for sharing. Wonderfully put, Damon. This one is definitely a treasure. Thank you, Katie. I will add this title to the list of poetry books for the 4th grade teachers that I work with. Thank you for showcasing this book. They will love it, Carol. It's a great mentor text for powerful, descriptive writing. 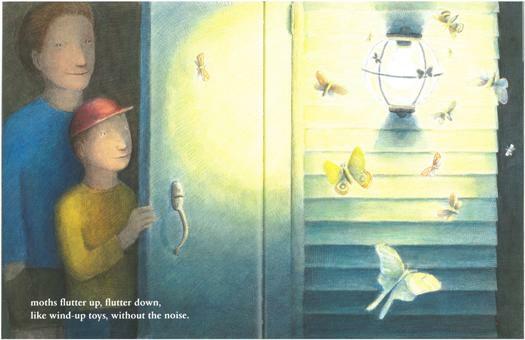 Not a surprise that something so beautiful came from Jane Yolen. I haven't heard of this one, so I will have to find it and read it. Thanks Katie. You will love it, Joyce! Thanks, Tabatha. The end really is the best, but it didn't fair to excerpt the end. I know you'll enjoy it! I agree with you, I want my rhyming books to be poetry, not saccharine, sing songy, and contrived. This sounds like a perfect example! Thanks for sharing - I can't wait to read the whole thing. You will love it, and I absolutely agree with you about rhyming books. Saccharine is the perfect adjective for what bothers me about so many of them. I've not read this one by Jane. I love her books! Awesome poetic lyrical language is also considered Word Play. Can't wait to read this one. She certainly has a way with words that is not to be missed. Glad that by highlighting a "classic," I could introduce you to a new book. What a beautiful book! Jane Yolen never disappoints. I'll be on the lookout for this. Thanks for sharing! This one is definitely incredible. How have I missed this book! Checking the library now to see if I can get my hands on a copy! Oh wow, you will not be disappointed, Mary Lee! I often use this book at the beginning of the year as a mentor text for descriptive writing. I actually like rhyming books (but the rhyme needs to be poetic and must flow when I read it). Jane is a master at rhyme and picture books. Good point, Linda. There is definitely a way to do rhyming picture books right, but oh so many do it easy instead. This is a masterful example of right.